Every participating newspaper in Thursday’s campaign — which includes large and small newspapers across the political spectrum — will write its own editorial, not necessarily using the same rhetoric as the politically left-of-center Globe. At The Tennessean, one of the largest newspapers in a state that voted 2-to-1 for Trump in 2016, Plazas emphasized that Thursday’s editorial would not target the president. Not only newspapers are participating in the campaign. The Radio Television Digital News Association is asking its 1,200 members to dedicate air time, post online editorials and share information on their social media platforms about the role they play in preserving the public’s right and need to know about government. “I have covered White Houses myself. I’ve watched this for a very long time. I have never seen — and I cannot imagine — a situation where there is more tension, hostility between the press corps and the president, mostly coming from the president,” said professor Frank Sesno, a former CNN White House correspondent who is now director of the School of Media and Public Affairs at the George Washington University in Washington, D.C. FILE – Reporters raise their hands as then-White House press secretary Sean Spicer takes questions during the daily briefing in the Brady Press Briefing Room of the White House in Washington, Feb. 22, 2017. The Globe’s campaign “shows how thin-skinned the media is in this case,” according to Don Irvine, chairman of Accuracy in Media, a nonprofit media watchdog organization. The president “took advantage of a pre-existing negative attitude towards the media,” concurred Gallup Poll editor in chief Frank Newport. The survey also revealed that 44 percent of American voters were concerned that Trump’s criticism of the news media would lead to violence against people who work in media. Breaking it down by party affiliation, 76 percent of Democrats felt that way, while 80 percent of Republicans did not. Fifty-five percent of those with no party affiliation expressed such concern. 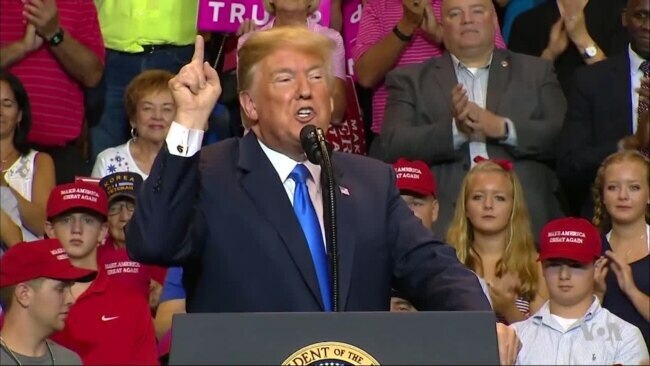 Such attacks could occur at one of Trump’s frequent rallies where the crowd is stoked by the president’s anti-media rhetoric, according to Robert Weissman, president of Public Citizen, a nonpartisan, nonprofit consumer advocacy organization. “So far, there’s been intimidation but no violence. But that line can easily be crossed, and anyone who’s seen the videos of some of these rallies knows we’re very close up against that line,” Weissman told VOA. FILE – White House press secretary Sarah Huckabee Sanders calls on a member of the media during the daily press briefing at the White House, July 18, 2018, in Washington. “The media has attacked me personally on a number of occasions, including your own network, said I should be harassed as a life sentence, that I should be choked,” Sanders replied to the CNN White House correspondent. For some critics, the blame for the lack of civility falls squarely on the president’s shoulders.